Abandon all hope, ye who enter here expecting some sort of spin-off movie revolving around a certain fan-favourite X-Men character. 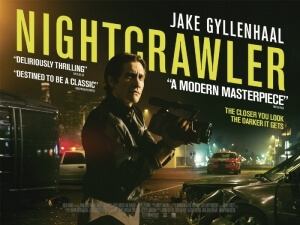 Instead, the exact opposite – Nightcrawler dives into a very dark area of modern media as well as the people who provide it for the airwaves, giving us an unnerving but enthralling viewing experience not unlike the gruesome newscast the film depicts. At the centre of it all is Jake Gyllenhaal as our lead character Lou Bloom, who is introduced to us initially as a scrap metal thief who brutally silences a security guard before taking and wearing his watch. From there, his already-warped mental state goes off on an even more dangerous tangent when he finds himself attracted to the idea of filming amateur footage of major crime scenes – he breaks into a family home already involved in a crime scene, and even moves a corpse from a car crash into a nearby lit spot, all with the ambition of creating that perfect shot to get his name out there. It’s extremely unsettling behaviour and Bloom’s excitable face as he carries out these self-appointed tasks is akin to a child discovering his favourite type of sweets for the first time (though in his case, Bloom’s sugar rush makes him do some crazy things indeed). Needless to say, Gyllenhaal is fantastic in the part with his dramatic weight-loss of roughly twenty pounds providing his character with a bony and almost lifeless exterior that compliments his anti-social and robotic behaviour disturbingly well. Comparisons will undoubtedly be made to similar figures like American Psycho’s Patrick Bateman or even the titular character on Dexter; but Bloom is an entity too fascinating for an easy mix ‘n’ match and has both the fierce determination and oddball confidence to stand out from that particular crowd. Yet another strong directorial debut emerges this year (they seem to really be coming out of their shell nowadays!) from Dan Gilroy, brother of Bourne screenwriter and Michael Clayton director Tony. With its primary location of Los Angeles, Gilroy – along with Oscar-winning There Will Be Blood cinematographer Robert Elswit – creates a dark and harsh streetlamp-lit atmosphere that is as uninviting as it is shiny and false, with everything feeling like a product of the times rather than a timeless wonder from its glossy news sets to the red and vibrant vehicle that Bloom and “intern” Rick (Riz Ahmed) purchase later in the film. Los Angeles has often been depicted as a land of false promises and selfish attributes, and Nightcrawler is no exception – as we learn from an intense rivalry between Bloom and Bill Paxton’s more experienced cameraman, this is a cutthroat world where no-one can be your true ally or even your true enemy; in the end, all that matters is if you get the recognition you feel you deserve and get a sizeable paycheck for doing so. Gilroy, also the screenwriter, makes us feel the desperation of these people and the harsh tactics they use to get what they want even if it means belittling or sometimes removing altogether the people who oppose them – in one particular scene, Bloom more or less bullies morning news director Nina (Gilroy’s wife Rene Russo, given some of her best material in years) into becoming romantically and sexually involved with him under the threat that if not he’ll shop his valuable footage to other networks. We do not see whether she goes through with it, but even still you can sense her eagerness to succeed overshadows her own moral compass even when faced with a reprehensible proposition. The film truly leaves its mark, however, with its overall portrayal of the media industry and its ruthless attitude when it comes to giving the audience what it thinks it wants. In a world where, sadly, organisations like TMZ exist and thrive on its own quote-unquote material, the desire as an audience to see as much as we can when it comes to reality is baffling and somewhat dangerous, giving the subjects and their own private lives. The film has characters that use the “if it bleeds, it leads” cliché like it’s Biblical scripture, and sure enough the bloodier the crime the more people are interested in seeing the gruesome footage and, thus, earning higher ratings for the network in question. Lou Bloom uses this audience awareness to his own ends, giving him endless opportunities to exploit and invade on the lives of the various victims he comes across, knowing full well that there will be an audience for it no matter what. It’s debatable what’s worse: someone like Bloom is manipulating the facts and visuals for the sake of his art, or that anyone tuning in and watching his findings is effectively encouraging him to do it again and again and again. We, as a society, cannot help but rubberneck into the lives of others when something happens in full public view, and the media – especially the type represented in this film – constantly allows us a window through which we can peer and stare for however long their time slot allows. Nightcrawler offers a disturbing and, at times, terrifying look at media manipulation and the things some people will do to satisfy a hungry audience while simultaneously getting something out of it for themselves – thanks to strong direction by Dan Gilroy and a commanding lead performance by Jake Gyllenhaal, the dark underworld of journalism has never been darker.